The Prayer Shawl Ministry is a circle dedicated to making shawls to wrap those in need of comfort in God’s love. Several years ago, Presbyterian Women started a Prayer Shawl Ministry at FPCP. The individual making the shawl begins the process with prayers and blessings for the recipient of the completed shawl. These prayers are continued throughout the creation of the shawl. Upon its completion, a final blessing is offered before the shawl is sent on its way. Shawls can be given to individuals undergoing medical procedures; to comfort someone after a loss or in times of stress; during a period of bereavement; in celebration of a marriage ceremony or the birth of a child; during an illness and/or recovery; or as a way of ministering to others… There are many possibilities! When women make prayer shawls, they are never sure who will receive their work of art, knitted or crocheted in love and prayer. All they know is that someone will be blessed by it, and hopefully God’s healing love will flow into their lives through the shawl they have created. The prayer shawl ministry has changed lives and helped begin the process of healing for many. 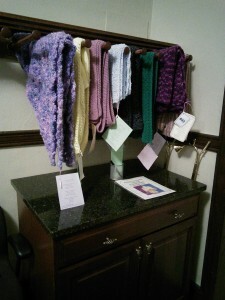 Shawls are located in the new display in the hallway across from the Library. Church members may take a shawl for anyone they feel in need of this kind of support. We simply ask that you fill out an information card located on the display cabinet. If you would like to knit or crochet shawls to contribute to this ministry of prayer and comfort, please join us on the 4th Thursday of the month in the Hearth Room from 7:00pm – 9:00pm, September through May. If you have any questions, please contact Darlene or Ginny at the numbers listed in the contact information. 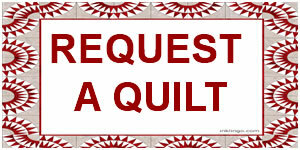 Click the link below and download the “Request a Quilt” form.